Today we focused on the Veneto region, home of Venice and many local seafood specialties from its lagoon. 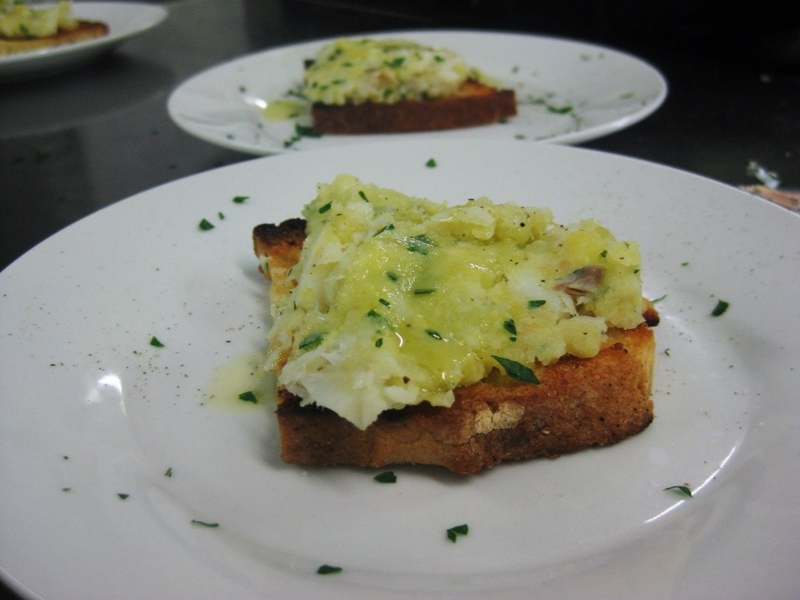 We started with an antipasto of spuma di baccala su crostini al burro or a buttered crostini with salted cod, mashed potatoes, garlic, and parsley. The salted cod has to be rehydrated in regularly changed water for two days before using it — clearly I don't have that kind of advance planning capability at home, so I'll have to figure out a good substitute (I'm thinking maybe a smoked trout could work). 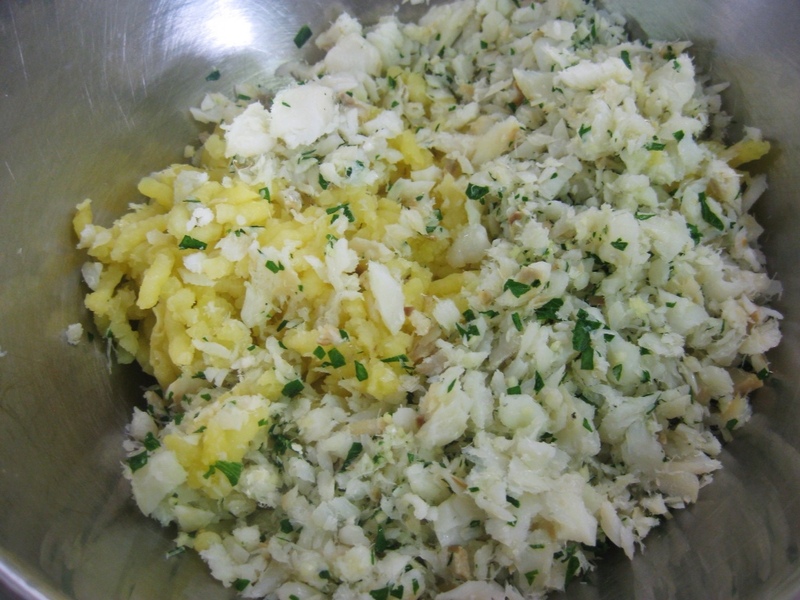 I boiled the fish and de-skinned and de-boned it, then minced it up with the rest of the ingredients. I forgot to peel the potatoes before cubing and boiling them and had to peel each piece individually once it was boiled – last time I will make that mistake! 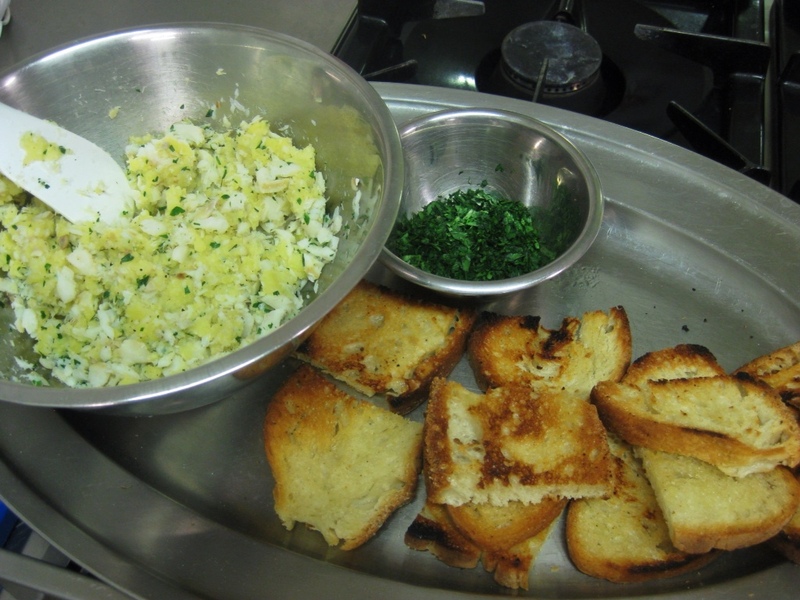 I also sautéed bread in a pan of butter until it was crisp then rubbed it with garlic and drizzled olive oil on top. The dish was very good and very subtle – I think I would probably reduce the amount of potatoes to let the fish flavor emerge with more clarity and would toast the bread with olive oil rather than butter, which somewhat dominated the flavor. 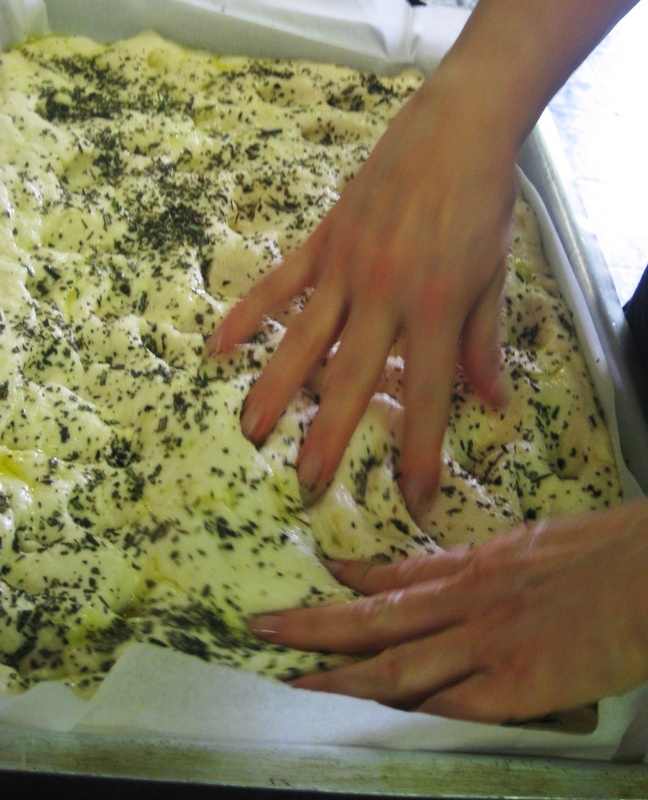 Alongside the antipasto we also made rosemary focaccia, which is surprisingly easy to do. 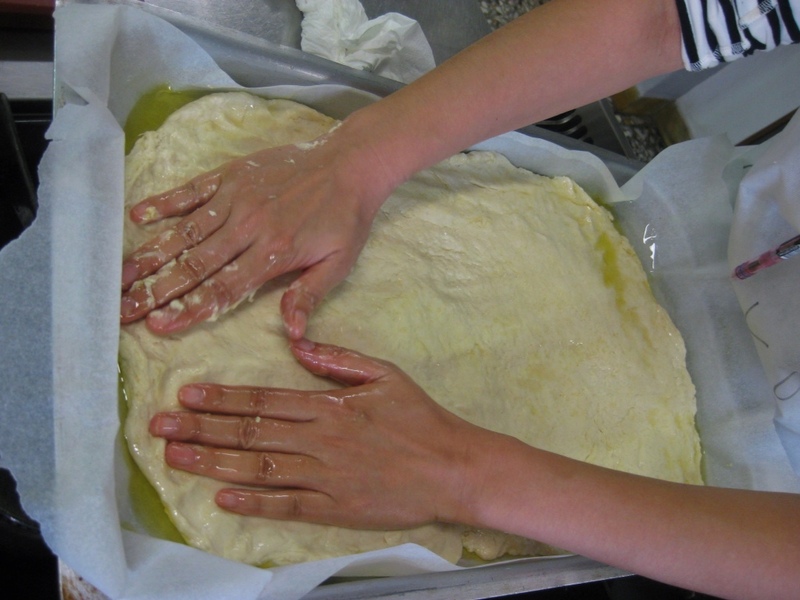 The dough is flour, lukewarm water, and yeast and then you spread it out on a baking pan with copious amounts of olive oil. 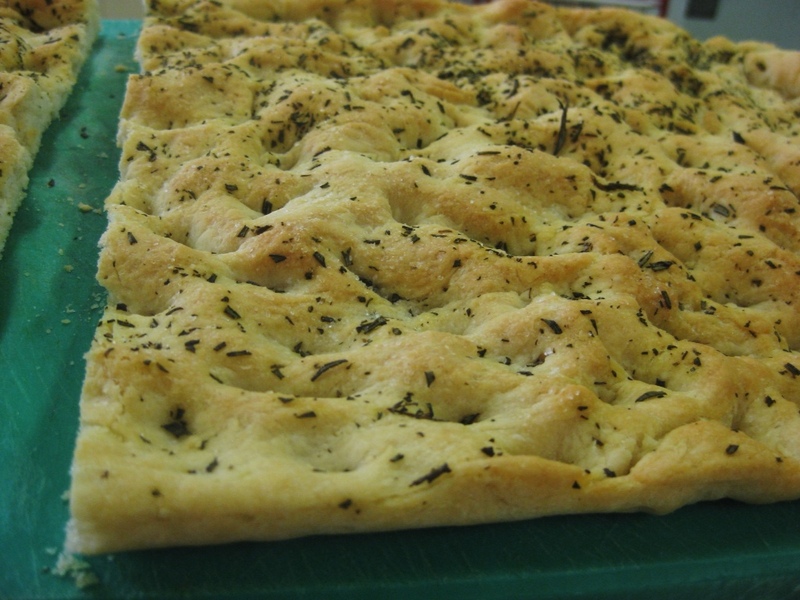 After letting it rise for a half hour, you press out the air bubbles from the sticky, porous dough with your fingers and then sprinkle salt and minced rosemary on top (or anything else you want…..so many delicious options) and bake it for a half hour until it is crisp and golden brown. 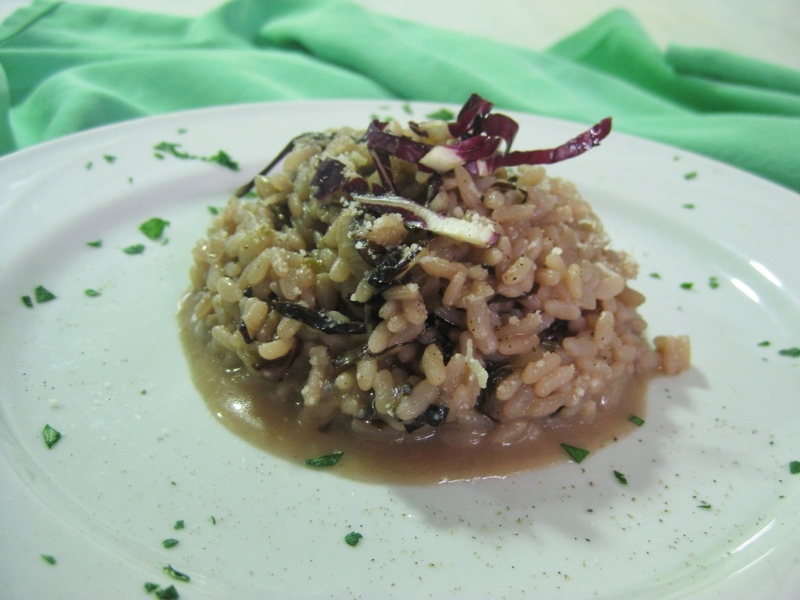 Next was the primo piatto of risotto al radicchio rosso or risotto with red endive, also sometimes called chicory. Risotto has always been a bit of a mystery to me so I was excited to try my hand at it. 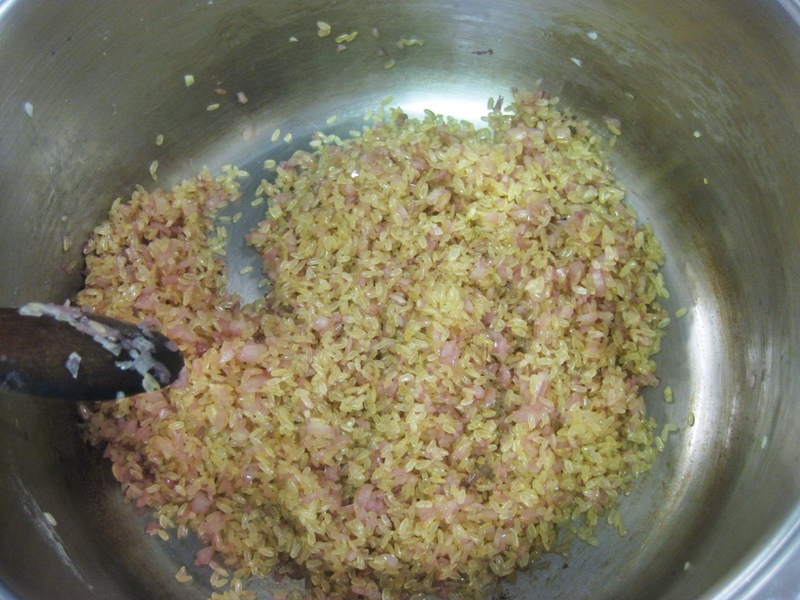 First we sautéed onions, pouring in a splash of red wine so that they wouldn't stick to the bottom of the pan, and then added the rice and toasted it, stirring constantly until it was translucent. 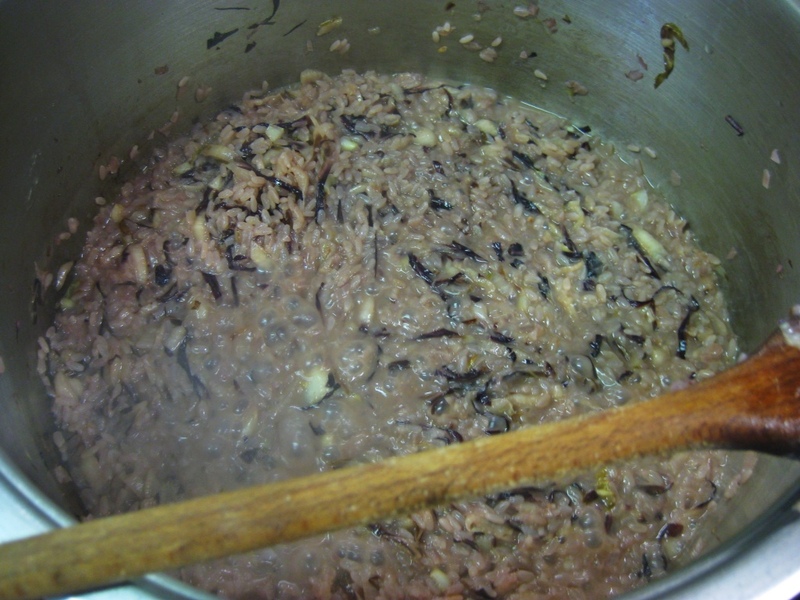 Next we added the radicchio and as it softened we poured in more wine. Once the alcohol had evaporated we ladled in a few rounds of freshly made vegetable broth, putting more in as it was absorbed. Once the rice was finished cooking we took it off the heat and added butter and parmesan and let it rest so that it would be “as smooth as a wave,” according to our teacher Luisa. While the texture was soft and supple the taste was a bit bitter from the radicchio, although it did create a beautiful purple palette for the dish. 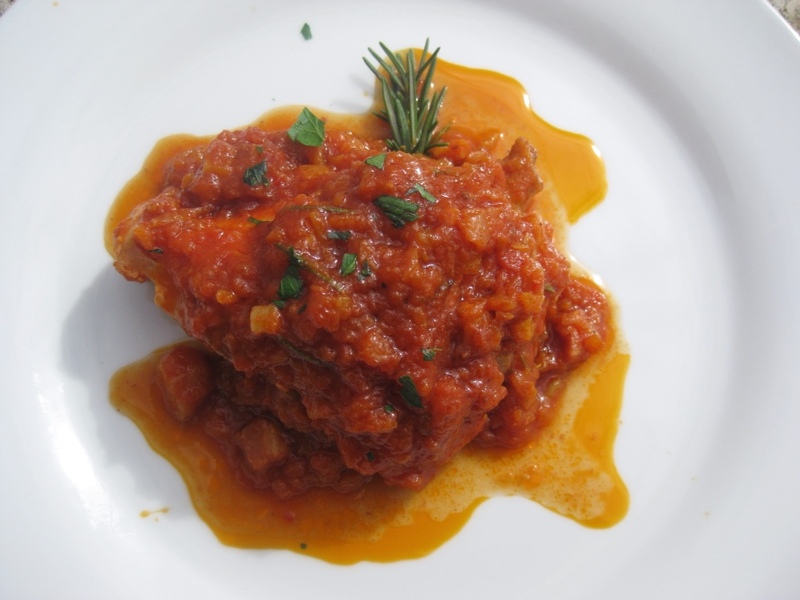 The secondo was pollo en tecia or chicken browned and braised in tomatoes, celery, carrots, onion, garlic, and herbs. We started by sautéing the sofrito (minced celery, carrots, garlic, onion), adding cubes of pancetta, and then chicken. 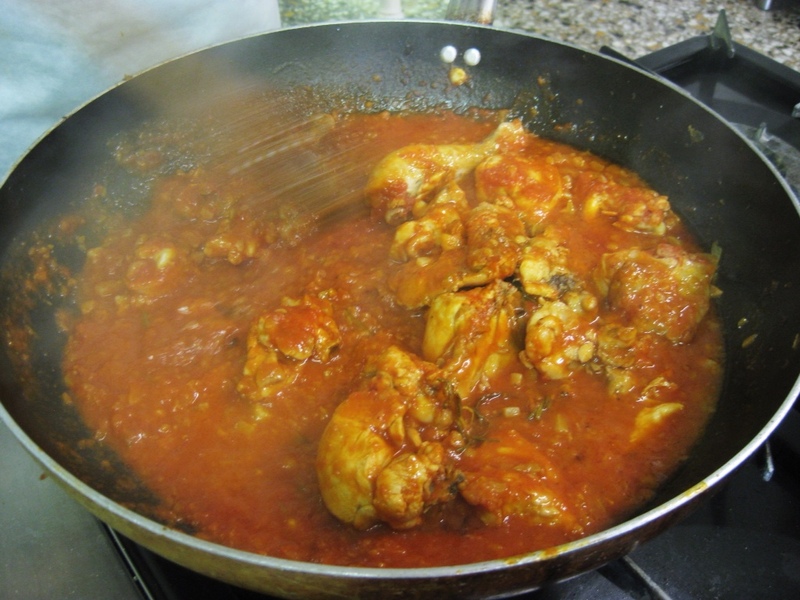 Once the chicken was completely browned we poured in the tomato concentrate and white wine as well as herbs (rosemary, sage) and then simmered it for an hour until the chicken was extremely tender. 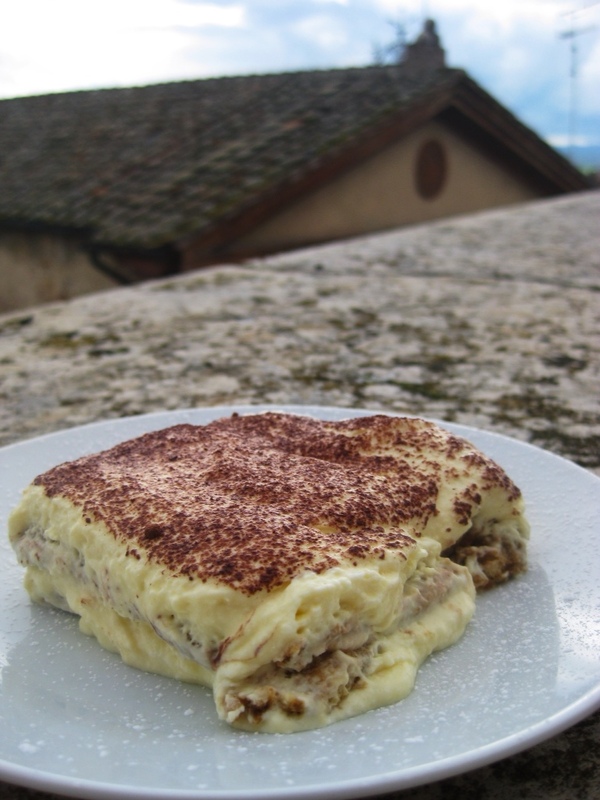 We served this with a contorno of fagiolini in umido or stringbeans prepared in a similar fashion. We again started by sautéing the sofrito base, then added tomato concentrate, the beans and herbs as well as hot water. We let this simmer for over an hour, periodically adding more water and stirring. 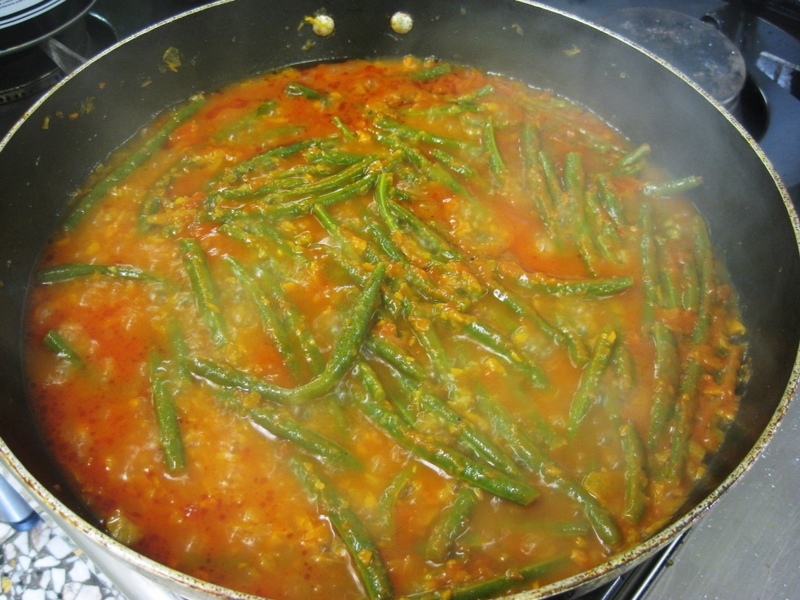 The string beans were delicious and melted in my mouth – not an attribute I usually associate with string beans, which I tend to cook “al dente” at home with little more than salt and pepper. 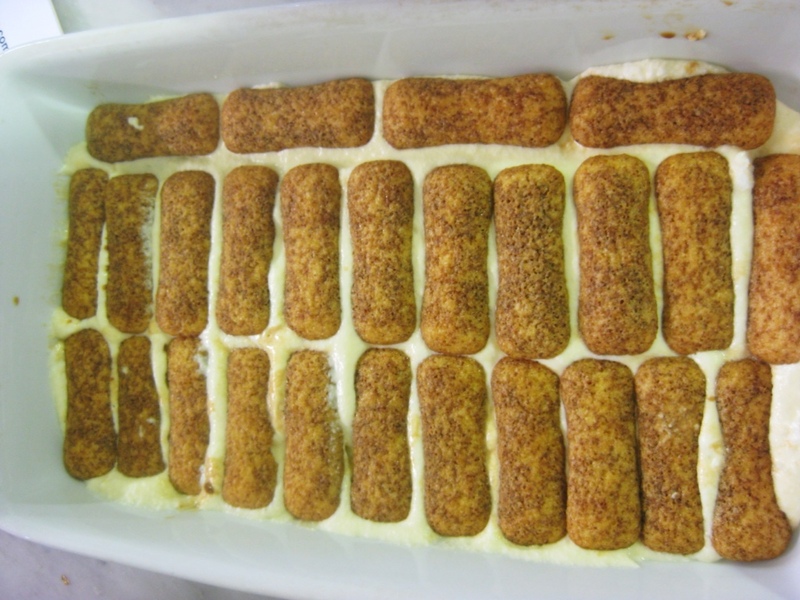 Our dolce was classic tiramisu. I started by separating the egg yolks from the whites (assuming that one egg makes enough for two people, according to Luisa) and then whipping the whites into a meringue-like substance with a hand blender – Luisa checked its readiness by turning the bowl on its side and making sure nothing moved (seems like a dangerous trick if the eggs weren't hard enough yet!) Next I blended the yolks with sugar until it was very creamy and then gently added in the mascarpone cheese. 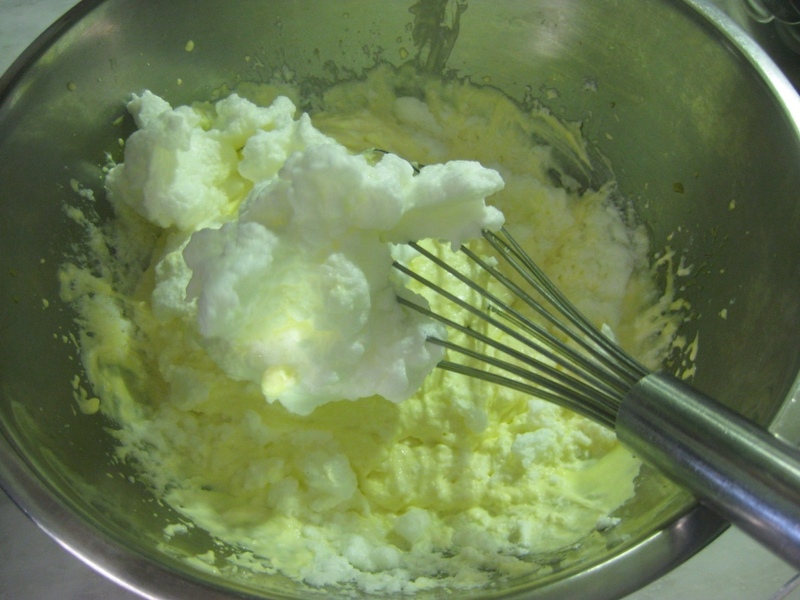 The egg whites were then folded in and the custard was ready to be spread on the bottom of the dish. 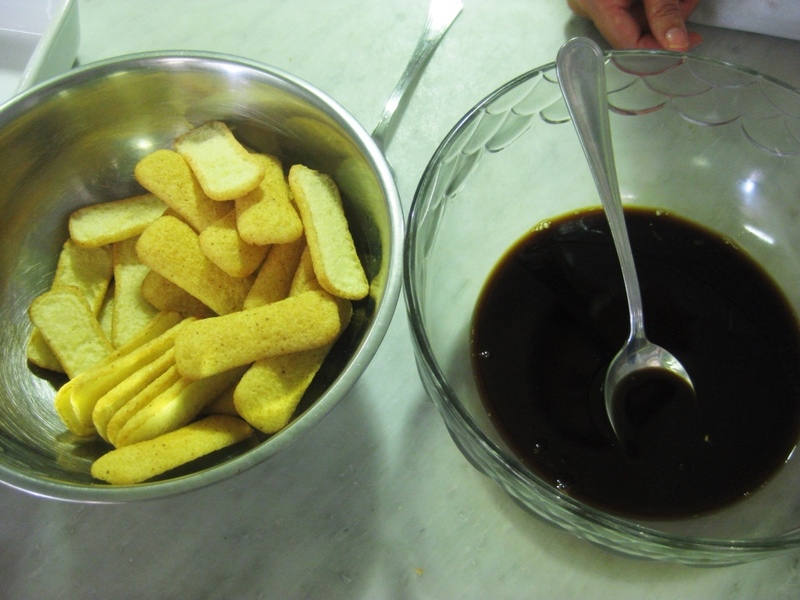 We put on a layer of ladyfingers dipped in a bowl of coffee mixed with sugar and brandy then repeated the layering process. Last came a fine dusting of cocoa powder and our delicate and delicious dessert was ready to eat. After over a week of classes, I'm starting to understand just enough about the cuisine to be able to pick out a few themes – for example, using sofrito as a base, or observing variations in how each chef makes his or her vegetable broth – and I'm starting to feel more comfortable identifying what I do and don't like about the recipes and how I might modify them when cooking back at home. I certainly feel like an absolute beginner – often clumsy or slow – especially compared to my very knowledgable classmates, but I'm starting to make progress and it feels great.